If you’re a small business owner and you want to boost your profits over the holiday season, consider taking advantage of Small Business Saturday. As you probably know, small businesses support the local economy in many ways, such as job creation and giving back to the community. American Express has been driving the Small Business Saturday movement since 2010 because they understand the importance of small business success. American Express supports restaurants, retail establishments and other small businesses. Small Business Saturday is meant to help these businesses by making consumers aware of the small businesses in their local communities. It is held every year on the Saturday after Thanksgiving. This year, it’s Saturday, November 28. What’s fantastic about Small Business Saturday is American Express includes free marketing materials and appearance on the Shop Small Map (if you accept American Express) to help you promote your small business. Many of the resources are free and it’s not necessary to be an American Express customer. In fact, American Express will showcase you on the ShopSmall.com home page and you can apply to get your business featured. Keep in mind that the deadlines are reported as TODAY, November 16 for a Shop Small Listing and to apply for the advertising program. 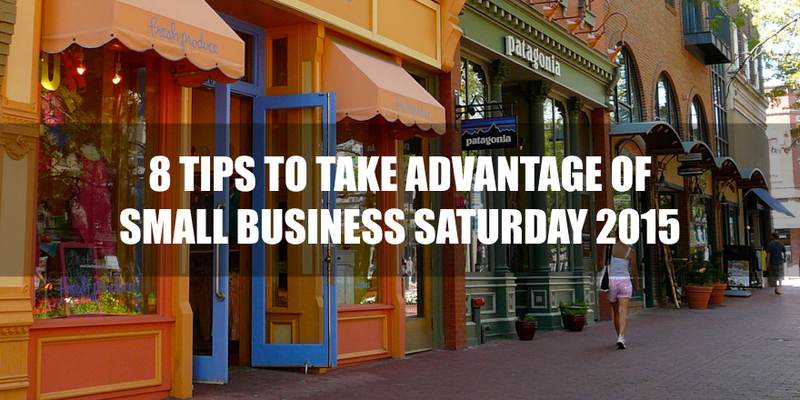 If you want to learn more ways to take advantage of Small Business Saturday, keep reading. Do you want to get more people in the door? Consider creating an event or promotion that you can include when you promote your business. Creating a video that showcases your goods or services can go a long way towards promoting your local business for Small Business Saturday. Go even further and tell your audience about your connection to the local community and how this connection relates to Small Business Saturday. Your goal is to engage customers and prospects. Once you’ve decided on a promotion, make sure your loyal customers and prospects know about it. Assuming you’ve created an email marketing list, promote your events and offers with the subscribers of your newsletter or create a special campaign to build some buzz before your event. Include stories of how your business supports your local community. Consider adding an RSVP if you want to know of how many of your customers and prospects might attend your event. This helps you avoid any surprises that you might encounter. If you haven’t already created a mailing list, Small Business Saturday is a great day to get one started. Train your staff to request that customers sign up for the mailing list in exchange for coupons or other discounts. With Facebook, you can create local awareness ads for your business. Essentially, these ads are only shown to people who are in or near the neighborhood of your small business. You can learn more about them at: https://www.facebook.com/business/news/facebook-local-awareness. Connect with other local businesses and get involved with your city’s Chamber of Commerce. Hand out flyers about your upcoming promotion to your current customers, prospects and other businesses nearby. Hang information at your local coffee shops, libraries, recreational centers and grocery stores. Advertise in local newspapers, school newspapers and at charity events. If you use LifeTopix for contact management and customer relationship management, contact the clients and prospects that you’ve set up in contact groups and notify them of your special Small Business Saturday promotions. One of the ultimate goals of small business is to build loyal customers who will promote your products. If you haven’t already started a loyalty program, Small Business Saturday is a great day to get started. One of the simplest ways to create a loyalty program is through punch cards. Offering discounts for those who are frequent buyers, whether it’s coffee, pet food, vitamins or other goods and services, keeps customers coming back. If you don’t want to clutter your customer’s wallets with loyalty and punch cards, consider offering loyalty programs through a popular app, such as Perka. Getting the word out about your Small Business Saturday promotions through Twitter, Instagram, Facebook and your blog are vital for success. Create a blog post that talks about your events and promotions. Ensure you embed the video discussed earlier. On Twitter, take advantage of the #SmallBizSat and #shopsmall hashtags and schedule tweets to create buzz about your promotions. Combine these with your own special hashtag for your promotion to build momentum. Or you can go the extra mile by utilizing zip code targeting to reach your local audience. On Facebook, get the word out about your event or promotion on your Facebook page by creating an event or offer. Encourage those who visit your local visit to post pictures with your merchandise in order win free or discounted merchandise with your special hashtag, #SmallBizSet and #shopsmall hashtags. Google Adwords is a great platform for local Pay-Per-Click advertising. Using Adwords, you can set a budget and only pay when consumers click or tap your ads. For Small Business Saturday, drive consumers to a web landing page that supports your Small Business Saturday promotion or offer, which is optimized with keywords you select for Small Business Saturday, but you can also direct them to your website if you wish. What’s great about Google Adwords for small local businesses is you can target your ads in regions, cities or by a designated distance from your business. If you need help with Adwords, contact a Google Certified Agency or take an online course.